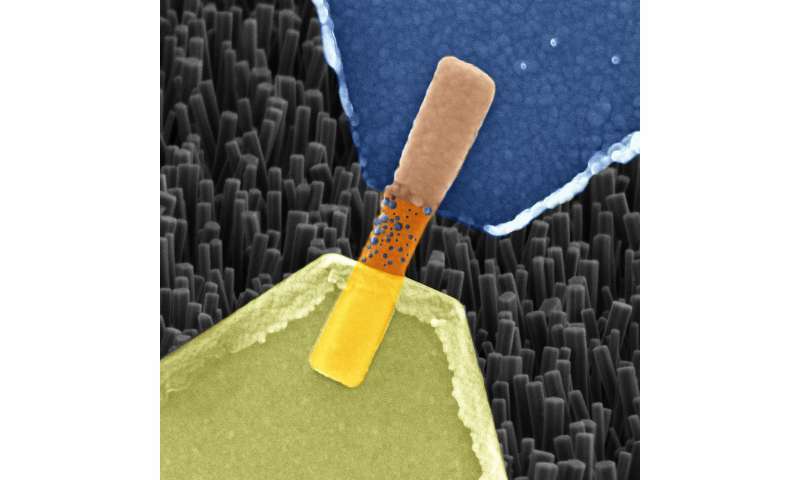 Scientists from Jülich together with colleagues from Aachen and Turin have produced a memristive element made from nanowires that functions in much the same way as a biological nerve cell. The component is able to save and process information, as well as receive numerous signals in parallel. The resistive switching cell made from oxide crystal nanowires is thus an ideal candidate for use in building bioinspired "neuromorphic" processors, able to take over the diverse functions of biological synapses and neurons. "With today's semiconductor technology, these functions are to some extent already achievable. These systems are, however, suitable for particular applications and require a lot of space and energy," says Dr. Ilia Valov from Forschungszentrum Jülich. "Our nanowire devices made from zinc oxide crystals can inherently process and even store information, and are extremely small and energy efficient."